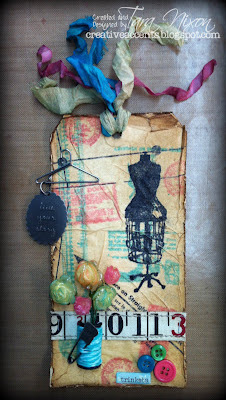 I had the pleasure of getting inky this weekend with a group of lovely ladies at our monthly 12 Tags Drop In, where we each created our own version of Tim Holtz's May tag! I decided to add some spring colour to my tag to brighten it up. We improvised on a few embellishments and used the smaller version of the stamps Tim used, but otherwise pretty much stuck to the instruction as Tim gave in his post. 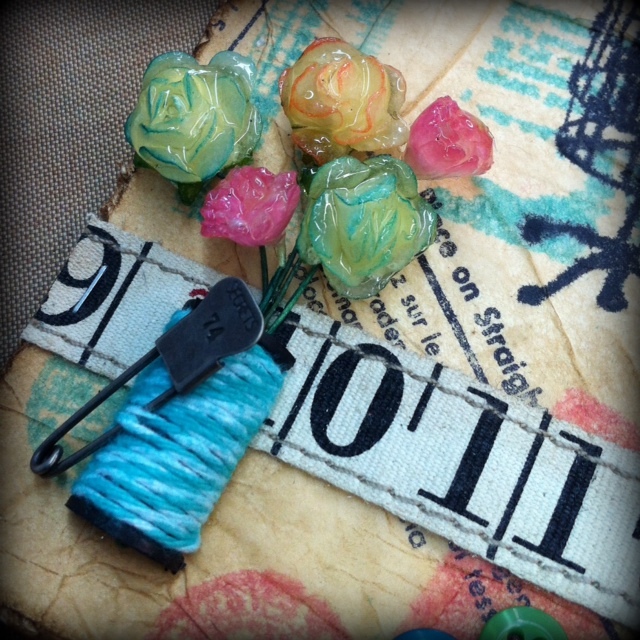 The colour in my project comes from the Archival inks in my background, Aquamarine and Rose Madder. I've had my eye on these colours for a while so it was nice to have an excuse to buy & use them :) My blue flowers were inked with the new Peacock Feathers Distress Ink, the soft pink one was inked with the Rose Madder Archival ink and the small pink ones were already coloured. I went into my stash and found an old charm from Making Memories to dangle from my hanger, added some buttons and a sticker from Tim's Idea-ology file tabs. Janet was sweet enough to bring us some bobbins she'd had her hubby cut in half for us. My thread fell off when I tried to ink it (oops!) so I wrapped twine around it instead. Isn't it cute? Thanks for checking out my version of Tim's May tag! Such a fab tag! I love all the colors and different elements. They come together so beautifully!